Start off your visit on the 19th (Sun): explore and take pictures at The Great Ocean Road and then take some stellar pictures from Point Danger Lookout. Here are some ideas for day two: indulge in some personalized pampering at some of the best spas, enjoy the sea views from Split Point Lighthouse, then kick back and relax at Bells Beach, and finally let little ones run wild at Torquay Foreshore Play Park. To see maps, traveler tips, reviews, and other tourist information, refer to the Grovedale trip itinerary maker app . Melbourne to Grovedale is an approximately 1.5-hour car ride. May in Grovedale sees daily highs of 20°C and lows of 8°C at night. Wrap up your sightseeing on the 20th (Mon) to allow time to travel to Albury. Albury, a major regional city in New South Wales, Australia, is located on the Hume Highway and the northern side of the Murray River. Start off your visit on the 21st (Tue): browse the collection at Albury LibraryMuseum, explore the activities along Lake Hume, then pause for some photo ops at Monument Hill, and finally take in nature's colorful creations at Albury Botanic Garden. For photos, maps, traveler tips, and other tourist information, read our Albury road trip planning app . Explore your travel options from Grovedale to Albury with the Route module. In May, daily temperatures in Albury can reach 20°C, while at night they dip to 6°C. Wrap up your sightseeing on the 21st (Tue) early enough to drive to Canberra. Kick off your visit on the 22nd (Wed): admire the masterpieces at National Gallery of Australia, explore the world behind art at National Portrait Gallery, and then get curious at Questacon. 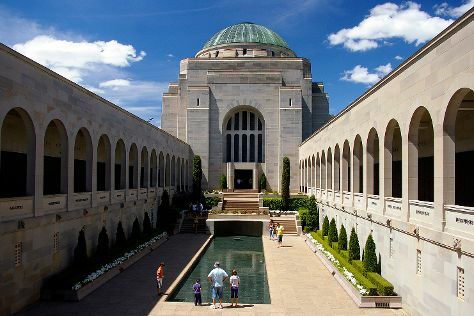 Get ready for a full day of sightseeing on the next day: take an in-depth tour of Australian War Memorial, then explore the activities along Lake Burley Griffin, and then ponder the world of politics at Parliament of Australia. For where to stay, maps, and tourist information, use the Canberra trip builder site . You can drive from Albury to Canberra in 4 hours. Other options are to fly; or take a bus. Expect little chillier evenings in Canberra when traveling from Albury in May, with lows around 2°C. Wrap up your sightseeing on the 23rd (Thu) to allow time to drive to Bathurst. Bathurst is a regional city in the Central Tablelands of New South Wales, Australia. Start off your visit on the 24th (Fri): see the interesting displays at National Motor Racing Museum, admire the landmark architecture of Abercrombie House, examine the collection at Australian Fossil and Mineral Museum, then take in the architecture and atmosphere at All Saints Cathedral Bathurst, and finally walk around Machattie Park. To see ratings, where to stay, other places to visit, and other tourist information, go to the Bathurst trip itinerary maker app . Drive from Canberra to Bathurst in 3.5 hours. Alternatively, you can do a combination of bus and flight; or do a combination of flight and train. In May in Bathurst, expect temperatures between 21°C during the day and 5°C at night. Finish your sightseeing early on the 24th (Fri) to allow enough time to drive to Katoomba. Venture out of the city with trips to Norman Lindsay Gallery & Museum (in Faulconbridge), Jenolan Caves (in Jenolan Caves) and Bilpin Cider Company (in Bilpin). 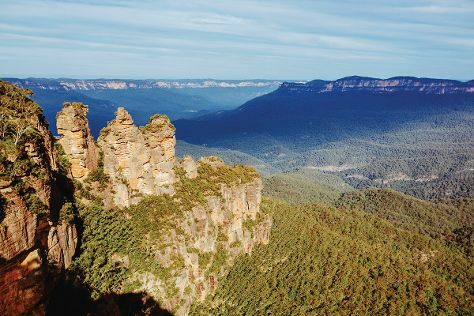 There's still lots to do: take some stellar pictures from The Three Sisters, get to know the fascinating history of The National Pass, don't miss a visit to Gallery Blackheath, and take your sightseeing to a higher altitude at Blue Mountains. For ratings, reviews, maps, and other tourist information, use the Katoomba vacation site . Getting from Bathurst to Katoomba by car takes about 1.5 hours. Other options: take a train; or do a combination of bus and train. In May, plan for daily highs up to 24°C, and evening lows to 8°C. Wrap up your sightseeing on the 29th (Wed) early enough to drive to Kiama. On the 30th (Thu), take an in-depth tour of Historical Aircraft Restoration Society, take in the dramatic scenery at Minnamurra Falls, and then take in the dramatic natural features at Kiama Blowhole. On the 31st (Fri), you'll have a packed day of sightseeing: get great views at Little Blowhole Reserve “Endeavour Lookout” and then find something for the whole family at Jamberoo Action Park. To find traveler tips, more things to do, maps, and more tourist information, refer to the Kiama trip planner. Traveling by car from Katoomba to Kiama takes 2.5 hours. Alternatively, you can take a train. In May, daily temperatures in Kiama can reach 23°C, while at night they dip to 11°C. Finish your sightseeing early on the 31st (Fri) so you can travel to Narooma. Narooma is a town in the Australian state of New South Wales on the far south coast. On the 1st (Sat), get a new perspective on things with Boat Tours & Water Sports, then look for gifts at Abc Cheese Factory Central Tilba, and then don't miss a visit to Central Tilba Historic Village. For photos, more things to do, reviews, and tourist information, use the Narooma road trip planner . Traveling by car from Kiama to Narooma takes 3 hours. In May, plan for daily highs up to 22°C, and evening lows to 9°C. Cap off your sightseeing on the 1st (Sat) early enough to travel back home.